Dr. Alexander Poltorak, who holds a PhD in theoretical physics, is a noted lecturer on the intersection of science and Torah. He is Chairman & CEO of General Patent Corporation, a patent licensing firm. He is currently an Adjunct Professor of Physics at The City College of New York and Research Fellow at the CUNY Institute for Ultrafast Spectroscopy and Lasers. Earlier in his career, he served as an assistant professor of physics at Touro College, where he was also the Director of Student Life, and an assistant professor of biomathematics at Cornell University Medical College. He was US Co-chair of the subcommittee on Information Exchange of the US-USSR Trade and Economic Counsel. He authored A Light Unto My Path: A Mezuzah Anthology, and books on intellectual property. He published research papers on General Theory of Relativity and brain research. 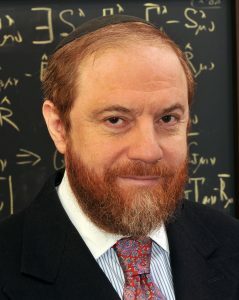 His articles appeared on Chabad.org and videos of some of his lectures can be found on TorahCafe.org. Prof. Poltorak founded Ayin Institute for Interdisciplinary Studies and writes a blog on Torah and Science, QuantumTorah.com.